Saturday, October 14th Coming up soon!! Please mark your calendars for our mission trip on Saturday, October 14th to the Food Project’s Ingalls School Farm in Lynn, MA. The Food Project Serve and Grow Program is suited for youth age 14 or older and adults. This is a great opportunity for the High School youth to spend a day of community service together. We will leave the Church at 8:30 AM and return by 1:30 PM. 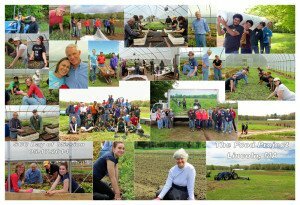 The Food Project requests that each volunteer contribute $10 to support the project. We will be working at the Ingalls School Farm, one of the Food Project’s inner city farms. We will be led by local High School Students, participating in educational games and discussions about the food system and then work in the fields to harvest and prepare the land for next years planting. The Food Project’s mission is to grow a thoughtful and productive community of youth and adults from diverse backgrounds who work together to build a sustainable food system. They produce healthy food for residents of the city and suburbs and provide youth leadership opportunities. Most importantly, they strive to inspire and support others to create change in their own communities. Together we can make a difference for those who lack healthy, affordable food in the Greater Boston area.